Brice was born in 1890, the son of Joseph William Vockins and his wife Sarah née Summers. Brice’s forename appears unusual to those new to the Newbury area, but it is a remarkably prominent local name rumoured to have been first used by grateful mothers as a tribute to a doctor of that name. Brice was the youngest of the six children born to Joseph and Sarah, the other five being Joseph William (born 1876), Gertrude Blanche (1878), Edward Maurice (1879), Bertha Amelia (1882) and Mary Elliott (1885). Mary (named for her grandmother Mary Elliott Vockins) died very soon after her birth; her namesake died the following year aged 68. Joseph and his father (also Joseph William) were gardeners; in 1871 father and son were living in cottages off Donnington Square, which could mean they were employed by one or more of the householders in this prestigious development of large houses. However, this was also close to Miller’s market gardens and certainly by 1901 Joseph junior (Brice’s father) while living in Russell Road (well away from the large houses) described himself as a ‘market gardener’. Brice would have been educated up to the age of 12/13 in one of the local schools. He evidently showed a little more promise than many, which enabled him to get a job with the South Berks Brewery as a clerk. Presumably he would have demonstrated at school an aptitude for figures and the ability to write neatly; this would earn him a place as an office boy, running errands while learning to cope with the mundane paperwork that enabled a business to function efficiently. In time he would, perhaps, have risen to a position of responsibility within this important local company, but war intervened. When war was declared on 4 August 1914 Brice was 24 years old and was still working at the brewery. He did not rush to enlist not donning the khaki uniform until early 1916. It is possible that he signed up in late 1915 under the Derby Scheme. This last ditch attempt to avoid the need to introduce conscription, named after Lord Derby, the minister in charge of recruitment, encouraged men to sign up, not for immediate service, but for service when the need arose and call-up papers were issued. It was not long before single young men like Brice were called up. One advantage of the Derby Scheme was that recruits could sign up for service with units of their choice (a choice that was not always respected). Brice ended up serving with the 4th Battalion, Royal Berkshire Regiment, the local Territorial unit; it is very likely that he would have met up with a number of childhood friends when he eventually reached the front on being posted to the 1st/4th Battalion. 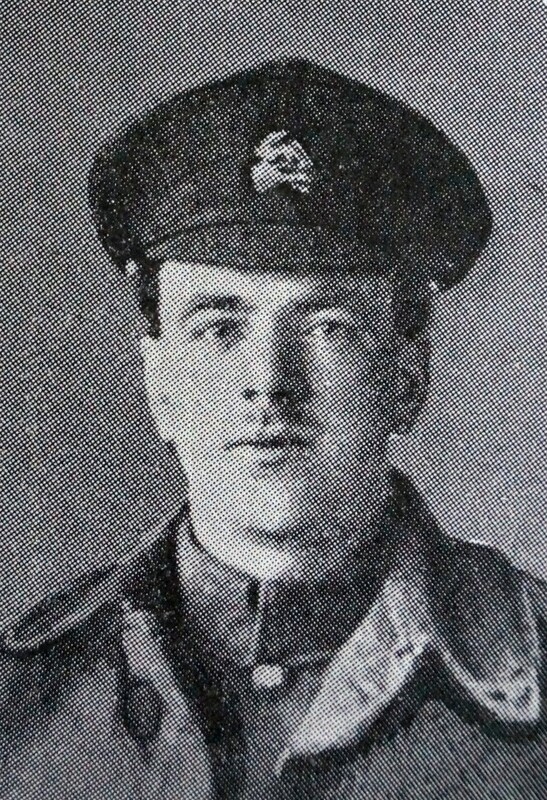 It is unlikely that he would have been sent abroad until late July at the earliest – a large number of replacements joined the battalion in the last days of July to make up the numbers after heavy casualties were taken during an attack at Pozières on 23-25 July. Brice may well have been among the new arrivals. Through August the battalion was in and out of the line as a part of the steady offensive that pushed the Germans back from Pozières towards Thiepval – many more casualties meant many more replacements. Whenever he arrived it was almost certainly before 13 September when the reality of their army commitment was brought home to the members of the battalion by the execution of one of their number, Private 5715 Charles Depper, for desertion. It is very likely that Brice knew Depper well; their regimental numbers suggest they enlisted within a day or two of each other and probably trained and travelled to France together. Depper had deserted on 14 August, making it to Amiens before being picked up by the Military Police the next day. He told the MPs that he was on his way to catch a boat to England as he was tired of serving in the trenches. For the remainder of September and early October the battalion was out of the line, training and providing working parties. On 12 October it was back to the line, relieving the 1/4th Battalion, Gloucestershire Regiment in trenches near Hebuterne. Two companies manned the line with one in support and the fourth in reserve. War Diary, 1/4th Battalion, Royal Berkshire Regiment – 13 October 1916. Hebuterne: A and B Companies relieved C and D Companies. A very busy day. Every man in the Battalion not on duty was employed in getting ready the trenches for the attack. Our lines were very heavily shelled for two hours – 8.15am to 10.15am – 5.9s 8” and 11”, especially for five minutes each at 9 o’clock and 10 o’clock, when the shells fairly rained in. The trenches were very badly damaged in many places and the damage was not repaired till late at night. Mrs Vockins, of 20, Maryport-street, Devizes, and late of Russell-road, Newbury, has received notice that her youngest son, Private Brice Oscar Vockins, of the Royal Berks Regiment, had been killed in action by shrapnel on October 13th. The bereaved mother has received a letter of condolence from the Chaplain and also one from his platoon commander, which stated that Pte Vockins was always cheerful and willing to do anything, no matter what the conditions. His sergeant also wrote saying he was one of the best men in the platoon, being liked by one and all, and that they missed him very much. A few days previous to the receipt of the fateful news, a cheerful letter had been received from deceased, saying he was quite well, and telling his mother not to worry. 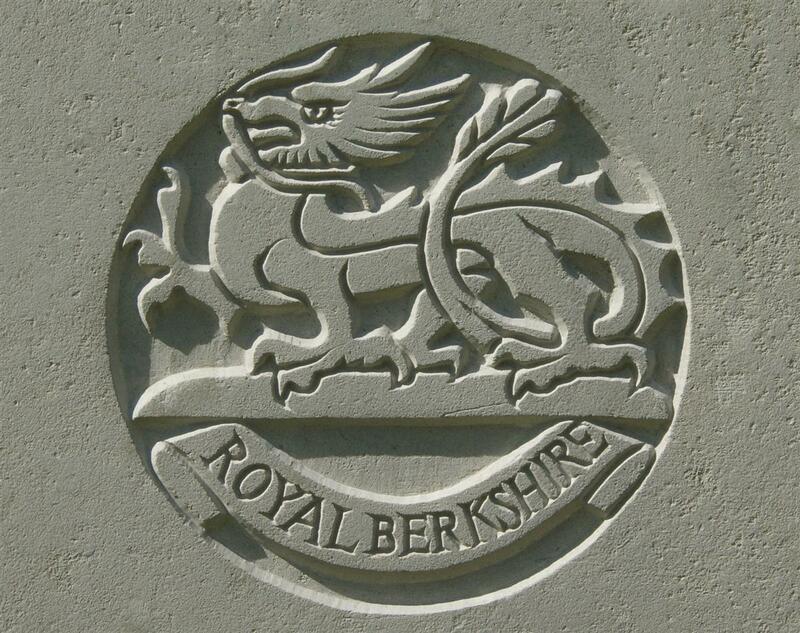 Prior to joining the Royal Berks Regiment, deceased was a clerk in the office of the South Berks Brewery Company. He put in his training period at Weston-super-Mare and Salisbury Plain, leaving the latter almost three months ago. Brice was buried in Hebuterne Military Cemetery, but subsequent disruption of the cemetery has meant that the exact location of his grave in unknown. His presence is recorded by a gravestone listed by the Commonwealth War Graves Commission as ‘Sp. Mem. 6’. Special Memorial stones like this, marked ‘Known to be buried in this cemetery’, can be seen in many of the surviving battlefield cemeteries, there are 19 such stones at Hebuterne, including two for German soldiers. Even burials in the UK could get misplaced – a stone like this marks the grave of Arthur Bew in Greenham churchyard. His sister Bertha took responsibility for communication with the Commission, selecting a very short epitaph ‘At Rest’, which is engraved on the headstone. 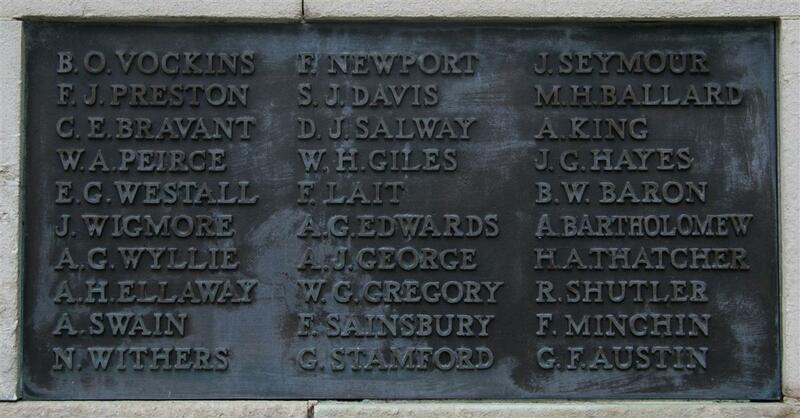 Locally Brice is remembered on tablet 4 of the Newbury Town War Memorial and on the memorial board and roll of honour in St Nicolas’ Church, Newbury. For a period in the 1860s Brice’s grandfather was the landlord of the Gardener’s Arms, a beerhouse in Oxford Road, Newbury. Perhaps he regaled his grandchildren with tales of happy days as a publican? Whatever the reason, Brice’s brother Edward Maurice Vockins took up life behind the bar. On 3 June 1907 he married Nellie Williams in Towcester, Northamptonshire, where they kept the Swan on the High Street – a pub that, according to a 1914 directory, doubled as a hairdresser’s. Edward’s service record survived the fire in 1940 that destroyed around 70% of such documents; although a little singed it shows that Edward attested under the Derby Scheme in December 1915, however, he was not called up for service until April 1917 – as a 35 year old in 1915 with a wife and three children (Gertrude Annie, Edward John and Doris May) he was far lower on the priority list than his 24 year-old brother, but even so his call up was later than would have been the norm. He served with the Middlesex Regiment, in several battalions (6th, 17th, 13th and 5th – his frontline service being with the 13th Battalion. On 12 December 1917 he fell into a shell hole on a particularly dark night, badly twisting his knee. This necessitated a local enquiry to ensure this was a genuine accident and not self-inflicted in an attempt to escape the trenches. Fortunately his corporal testified that it was indeed an accident and not further action was taken – until he reported that he had lost his lower dentures! It seems that they fell out of his mouth when he tumbled into the shell hole and he picked them up and put them in his pocket because they were muddy. When he reached hospital and sought to clean them up they were no longer in his pocket – the court of enquiry (held at Shoreham on Sea on 12 April 1918) determined that he had lost the dentures through ‘no fault of his own’. His knee was badly injured and was in plaster for three months and then strapped up. He was not fit to return to France until September 1918, even then the decision was made to transfer him to 229 Company, Labour Corps on 9 October. Soon after the war ended and he was demobilised on 20 April 1919. He returned to his family in Towcester, where he died on 9 October 1951. Joseph William Vockins was the eldest of the three brothers, 39 years old when he attested on 7 September 1916 after being conscripted. Like his brother Edward, William was married (to Elizabeth Ann Cornwall) and had three children: Iris, Joseph William and Vera Cornwall. He too had left Newbury and had settled in Wallington, Surrey. Strangely he renamed himself as William Summers Vockins under which name he married in Lewisham in 1909 and filled in his census return in 1911, however, he used Joseph William when he joined the army. Summers was his mother’s maiden name. His age/status group (39, married with children) were deemed to have enlisted on 24 June 1916, but his call-up papers were not issued until 30 August. Unusually he asked to be posted to the Military Police, no doubt hoping his experience as a solicitor’s clerk would result in a desk job associated with courts martial. He was to be disappointed and was posted to the Army Service Corps, the huge logisitics organisation responsible for the day to day transport and supply issues associated with keeping an army of well over 1,000,000 men in the field fed, clothed and equipped. There is no indication that he ever served abroad before he was discharged – unfit for further service – on 19 January 1918. His problem was myopia (short-sightedness), which must have been quite severe to prevent his continued service. Brice’s sister Bertha Amelia Vockins never married, she died in Southampton in 1972 aged 90. The final sibling Gertrude Blanche Vockins married George Goswell in 1910 after which they settled in Abingdon for a while. She too died in Southampton in 1963 aged 85, suggesting that the sisters may have spent their later years together. It is entirely possible that her husband George served during the war, but it has not been possible to identify him among the various George or G Goswells of whom some record of service has survived.